A Cardiff man who discovered a whole new career as a carer following a double redundancy blow is now in line for a top national award. After 20 years working in retail, Simon James, 46, was left wondering what his future held when he lost his job with Woolworths and then high street video retailer Blockbusters, both within the space of four years. But he was given hope after spotting an advert for a care giver with Cardiff-based care agency, Home Instead, which supports elderly people in their own homes across Cardiff, Penarth, Barry and Dinas Powys. Four years on and Simon, who lives in Thornhill, has just been shortlisted as a finalist at the prestigious 2018 Wales Care Awards, which aims to reward outstanding work in the social care sector. It is set to be extra special event as it also marks the Wales Care Awards’ 15th anniversary, and the 25th anniversary of organisers, Care Forum Wales. Simon hopes his success story will inspire others facing redundancy. He explained: “When I was made redundant, it was hard but then I saw some adverts for care and decided I should just give it a go. I did it on a whim and as a chance to do something totally different, not realising I would find my vocation. Cardiff-born Simon was nominated by his care manager, Gemma Williams, who said it was a collective office decision to put Simon forward, due to his ‘kind but determined nature to help his clients make the most out of life’. “Since the first week Simon came to work for Home Instead, it was obvious that he truly cares for the people he visits and treats his clients in the way he would like his own loved ones to be cared for,” Gemma added. 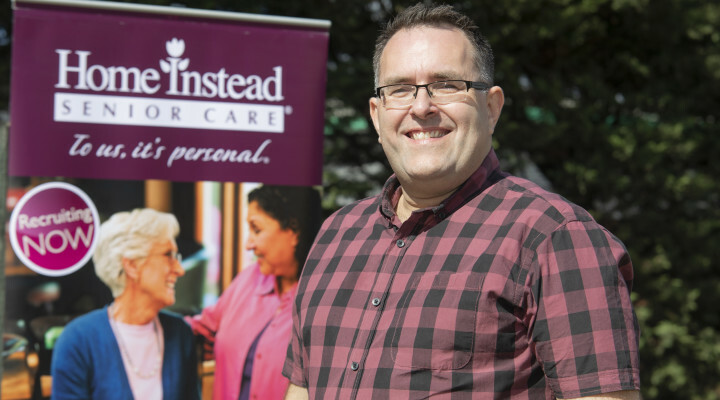 Simon works to help his clients to stay independent in their own home and with most in their 80s and 90s, he believes that quality time spent with his clients is as important as the physical support he provides. So popular is Simon with his colleagues, he has now been asked to mentor new caregivers joining Home Instead. “I was made redundant twice but what has come out of it is a vocation and this is a very positive message, as you can go on to do other things. And to now support others to do the job I love is really rewarding.